Brain single photon emission computed tomography (SPECT) is a well-established and reliable method to assess brain function through measurement of regional cerebral blood flow (rCBF). It can be used to define a patient's pathophysiological status when neurological or psychiatric symptoms cannot be explained by anatomical neuroimaging findings. Though there is ample evidence validating brain SPECT as a technique to track human behavior and correlating psychiatric disorders with dysfunction of specific brain regions, only few psychiatrists have adopted brain SPECT in routine clinical practice. It can be utilized to evaluate the involvement of brain regions in a particular patient, to individualize treatment on basis of SPECT findings, to monitor the treatment response and modify treatment, if necessary. In this article, we have reviewed the available studies in this regard from existing literature and tried to present the evidence for establishing the clinical role of brain SPECT in major psychiatric illnesses. Aims: The objective was to evaluate the prognostic value of exercise myocardial perfusion scintigraphy (MPS) in patients who underwent coronary artery bypass grafting (CABG). 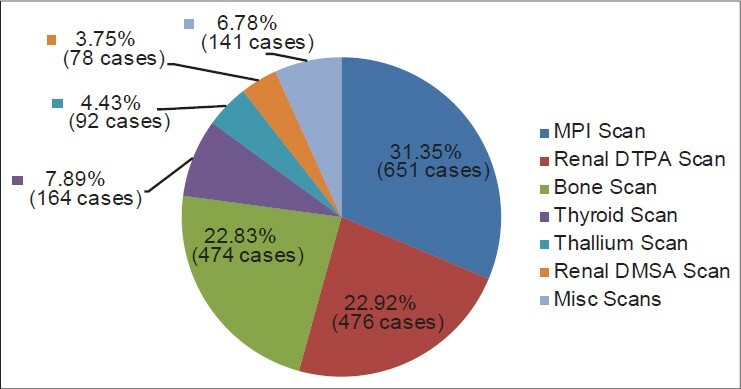 Subjects and Methods: A retrospective, one-center study of 361 patients with multivessel coronary artery disease was carried out. All the patients underwent MPS after CABG due to worsened health status. MPS was performed at 4.5 years standard deviation (SD: 0.2), based on symptoms. MPS was carried out using Tc-99m methoxy isobutyl isonitrile and following a 1-day protocol (stress-rest). The end points were analyzed at 6.5 years (SD: 3.3) after MPS, on the average. Statistical Analysis Used: SPSS software for Windows, version 13.0. The t-test or the χ2 -test was used. Survival times were calculated. A multivariate Cox proportional hazards model was developed. Results: During the follow-up, death occurred in 54 patients, and 37 patients experienced major adverse cardiovascular events (MACE). In the multivariate analysis, advanced age hazard ratio (HR: 1.45; 95% confidence interval [CI]: 1.4-2.02; P = 0.027), previous myocardial infarction (HR: 3.17; 95% CI: 1.22-8.2; P = 0.018), left ventricular ejection fraction of <40% (HR: 2.16; 95% CI: 1.2-3.89; P = 0.01), and the summed stress score (SSS) of ≥4 (HR: 1.87; 95% CI: 1.02-3.41; P = 0.04) were independent predictors of all-cause death. The summed difference score (SDS) was the only independent predictor of MACE (HR: 1.26; 95% CI: 1.06-1.48; P = 0.034). Conclusions: The parameters of MPS were found to have prognostic value in the long-term period after CABG. 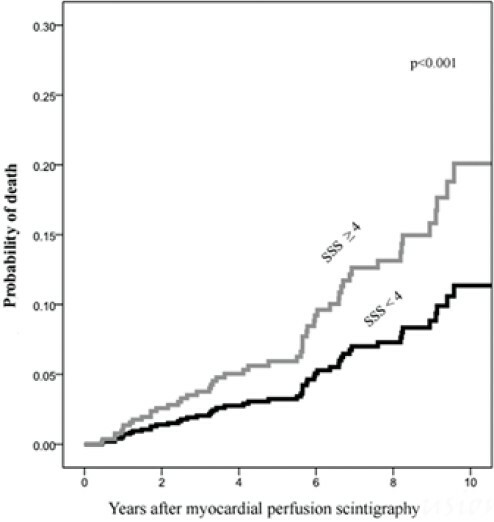 Advanced age, previous myocardial infarction, decreased left ventricular ejection fraction, and the abnormal SSS were associated with an increased risk of all-cause death. The SDS was found to be the only significant risk factor for MACE. Introduction: Professional radiation exposure cannot be avoided in nuclear medicine practices. It can only be minimized up to some extent by implementing good work practices. 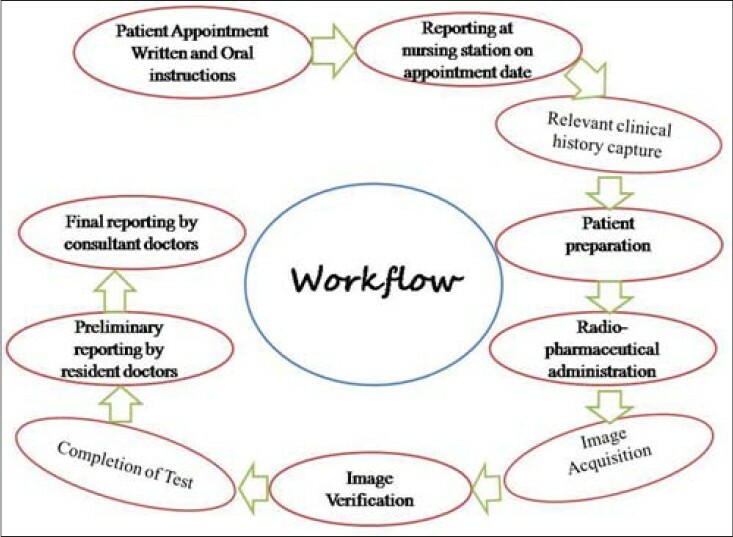 Aim and Objectives: The aim of our study was to audit the professional radiation exposure and exposure rate of radiation worker working in and around Department of nuclear medicine and molecular imaging, Tata Memorial Hospital. Materials and Methods: We calculated the total number of nuclear medicine and positron emission tomography/computed tomography (PET/CT) procedures performed in our department and the radiation exposure to the radiation professionals from year 2009 to 2012. Results: We performed an average of 6478 PET/CT scans and 3856 nuclear medicine scans/year from January 2009 to December 2012. The average annual whole body radiation exposure to nuclear medicine physician, technologist and nursing staff are 1.74 mSv, 2.93 mSv and 4.03 mSv respectively. Conclusion: Efficient management and deployment of personnel is of utmost importance to optimize radiation exposure in a high volume nuclear medicine setup in order to work without anxiety of high radiation exposure. 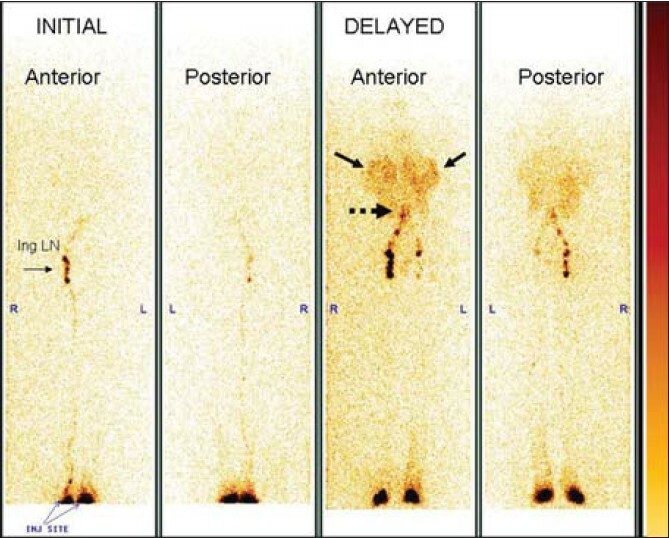 Purpose: Acquisition of higher counts improves visual perception of positron emission tomography-computed tomography (PET-CT) image. Larger radiopharmaceutical doses (implies more radiation dose) are administered to acquire this count in a short time period. However, diagnostic information does not increase after a certain threshold of counts. This study was conducted to develop a post processing method based on principle of "stochastic resonance" to improve visual perception of the PET-CT image having a required threshold counts. 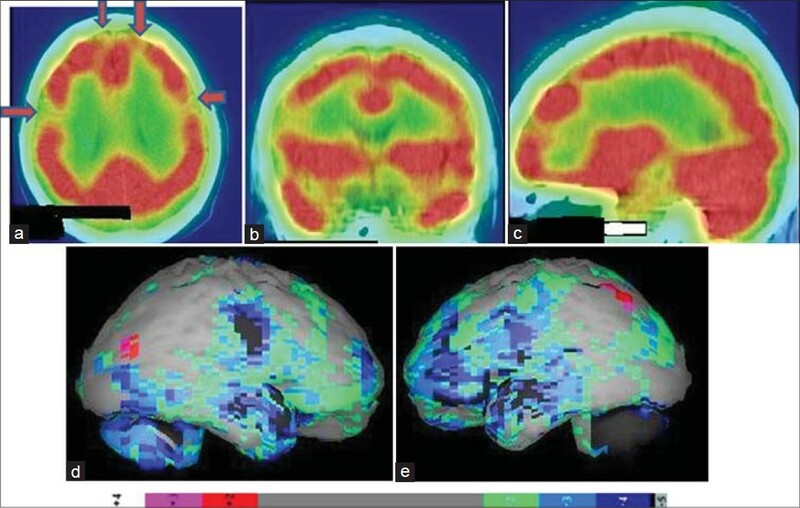 Materials and Methods: PET-CT images (JPEG file format) with low, medium, and high counts in the image were included in this study. The image was corrupted with the addition of Poisson noise. The amplitude of the Poisson noise was adjusted by dividing each pixel by a constant 1, 2, 4, 8, 16, and 32. The best amplitude of the noise that gave best images quality was selected based on high value of entropy of the output image, high value of structural similarity index and feature similarity index. Visual perception of the image was evaluated by two nuclear medicine physicians. 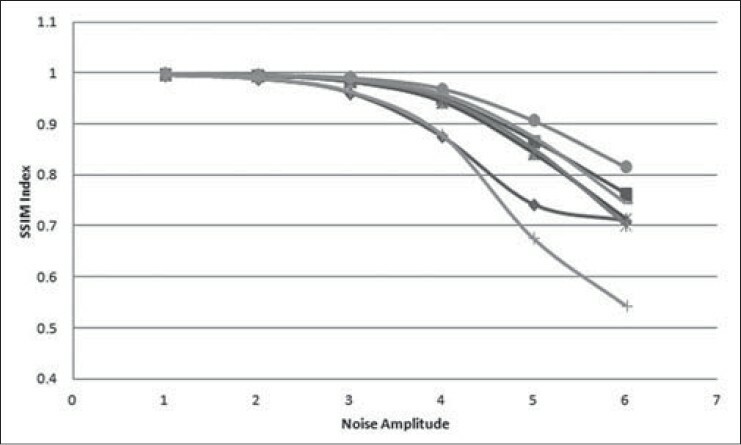 Results: The variation in structural and feature similarity of the image was not appreciable visually, but statistically images deteriorated as the noise amplitude increases although maintaining structural (above 70%) and feature (above 80%) similarity of input images in all cases. We obtained the best image quality at noise amplitude "4" in which 88% structural and 95% feature similarity of the input images was retained. Conclusion: This method of stochastic resonance can be used to improve the visual perception of the PET-CT image. This can indirectly lead to reduction of radiation dose. Context: Escalating health care expenses pose a new challenge to the health care environment of becoming more cost-effective. There is an urgent need for more accurate data on the costs of health care procedures. 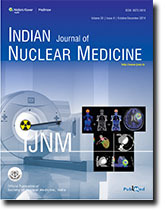 Demographic changes, changing morbidity profile, and the rising impact of noncommunicable diseases are emphasizing the role of nuclear medicine (NM) in the future health care environment. However, the impact of emerging disease load and stagnant resource availability needs to be balanced by a strategic drive towards optimal utilization of available healthcare resources. Aim: The aim was to ascertain the cost of diagnostic procedures conducted at the NM Department of a tertiary health care facility by employing activity based costing (ABC) method. Materials and Methods: A descriptive cross-sectional study was carried out over a period of 1 year. ABC methodology was utilized for ascertaining unit cost of different diagnostic procedures and such costs were compared with prevalent market rates for estimating cost effectiveness of the department being studied. Results: The cost per unit procedure for various procedures varied from Rs. 869 (USD 14.48) for a thyroid scan to Rs. 11230 (USD 187.16) for a meta-iodo-benzyl-guanidine (MIBG) scan, the most cost-effective investigations being the stress thallium, technetium-99 m myocardial perfusion imaging (MPI) and MIBG scan. The costs obtained from this study were observed to be competitive when compared to prevalent market rates. Conclusion: ABC methodology provides precise costing inputs and should be used for all future costing studies in NM Departments. 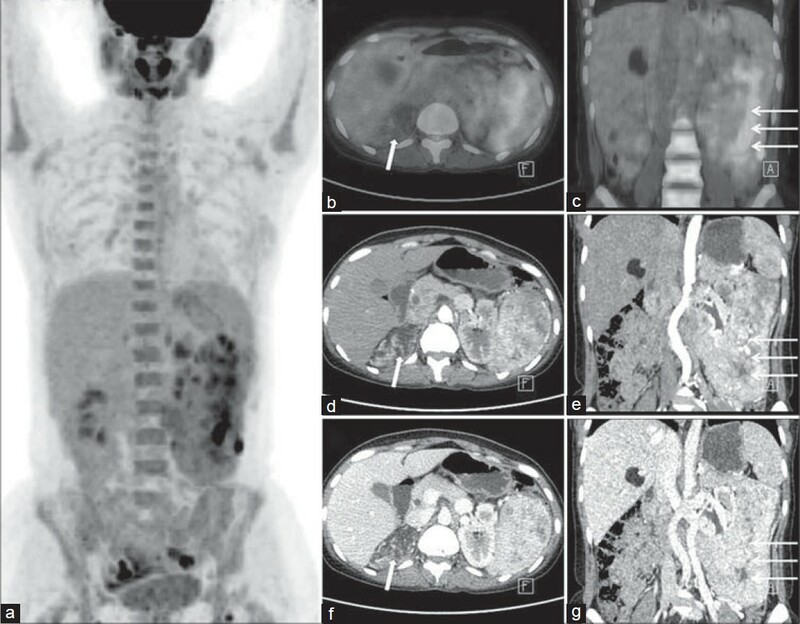 We report a rare case of leiomyosarcoma of the inferior vena cava (IVC) in which F-18 fluorodeoxyglucose (F-18 FDG) positron emission tomography-computed tomography (PET-CT) scan provided vital evidence, which led to its diagnosis, in a background of procoagulant state of the patient, where previous ultrasound-Doppler and echocardiography studies were nonspecific and revealed bilateral lower limb deep vein thrombosis with thrombus in IVC. The whole body F-18 FDG PET-CT scan was done in view of no significant improvement in clinical status of the patient over few months in spite of appropriate medical management. FDG PET-CT scan revealed high grade uptake in a large mass lesion occupying the right atrium, extending superiorly into terminal superior vena cava, inferiorly into dilated IVC and probably into hepatic veins. CT guided biopsy of this F-18 FDG avid mass was consistent with the diagnosis of leiomyosarcoma, which however was not amenable to surgery at this stage. 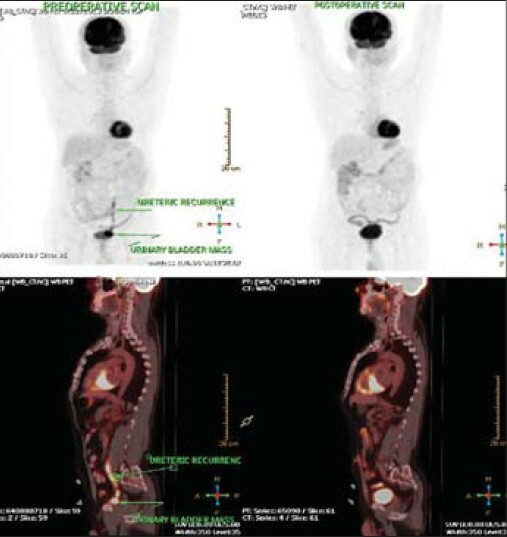 F-18 FDG PET-CT accurately differentiated tumor mass from bland thrombus and further had a significant impact on the management, since aggressive surgery combined with adjuvant therapy offers the best outcome for patients with leiomyosarcoma of the IVC. Pulmonary artery sarcoma (PAS), although rare, must be considered in the differential diagnosis of pulmonary thromboembolism (PTE). This tumor is highly malignant and the prognosis is very poor. 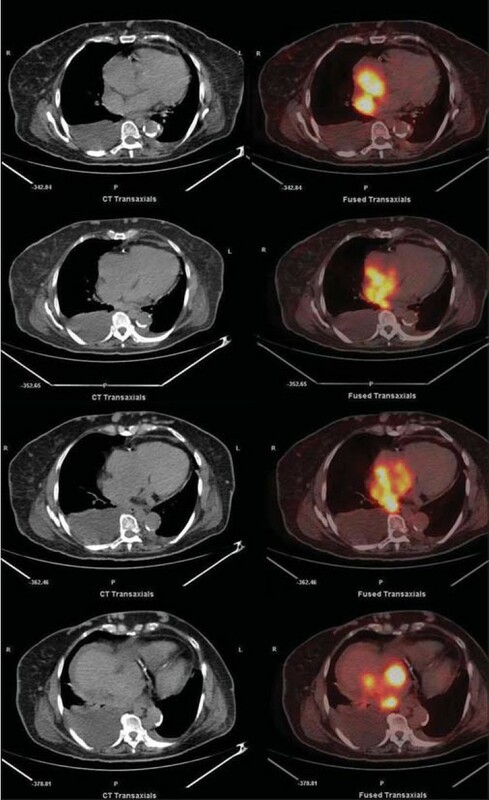 As much as the standardized uptake values (SUVs) at fluorine-18 fluorodeoxyglucose positron emission tomography (18F-FDG PET) have helped in differentiating between benign and malignant tumors, visualization of a low-attenuation filling defect within a pulmonary artery on contrast-enhanced chest computed tomography (CT) can be suggestive of a malignancy, such as PAS, if the lesion shows high FDG uptake at PET. We present a case of PAS that showed high FDG uptake on integrated FDG PET/CT and with lung metastasis. Patient underwent endoscopic bronchial ultrasound-transbronchial needle aspiration (EBUS-TBNA), which confirmed spindle cell sarcoma. Neurolymphomatosis is defined as infiltration of the peripheral nervous system by malignant lymphocytes in the presence of lymphoma. 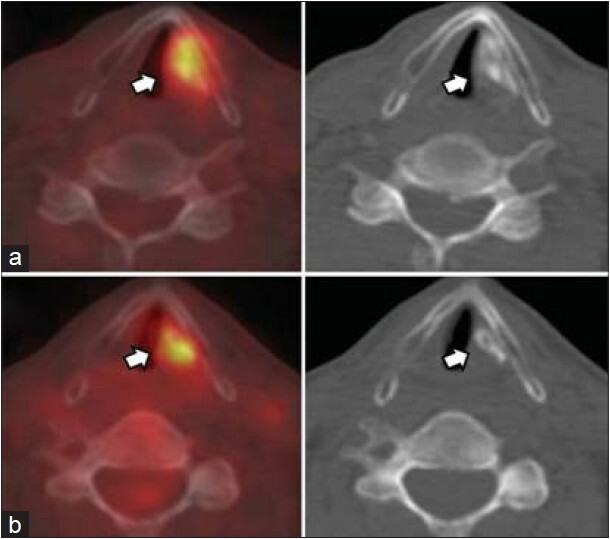 In this case, we described multiple neurol involvement and findings of 18 F-fluorodeoxyglucose positron emission tomography/computerized tomography in a 35-year-old female diagnosed with B-cell lymphoma. Hemichorea and generalized chorea are rare syndromes associated with nonketotic hyperglycemia. This disorder usually afflicts elderly females, and may herald the onset of new onset diabetes, usually type 2. There are conflicting reports of the underlying pathophysiology of this rare entity. Magnetic resonance imaging findings have been described in the past, and are characteristic. 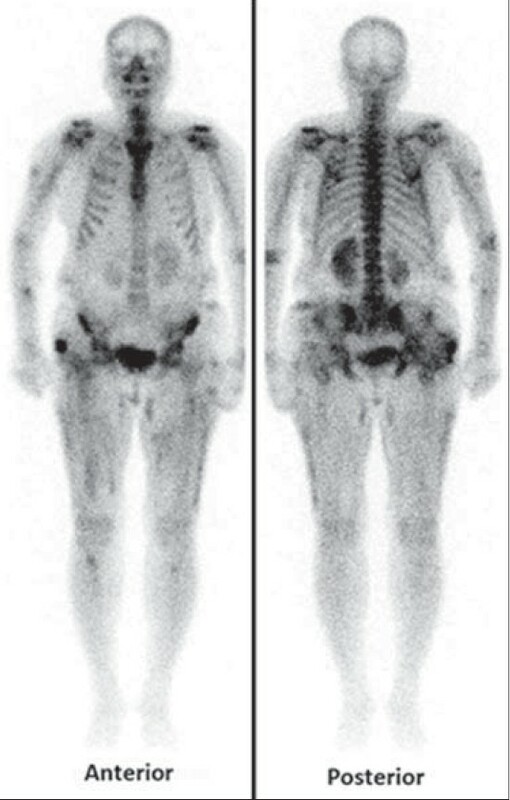 There are very few reports of 18F-fluorodeoxyglucose positron emission tomography/computed tomography (PET/CT) findings of this unusual dyskinetic syndrome. 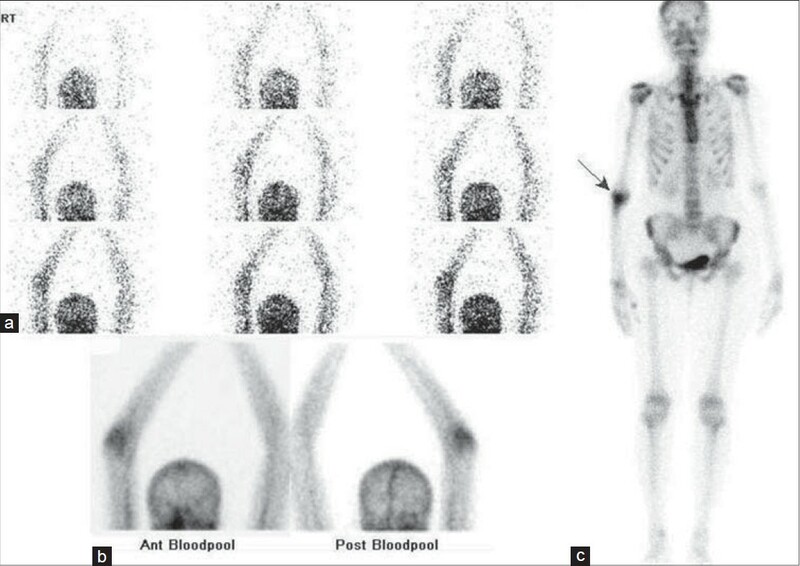 This report describes the PET/CT features of this rare disease. Early detection and prompt correction of hyperglycemia may lead to complete or significant amelioration of symptoms. 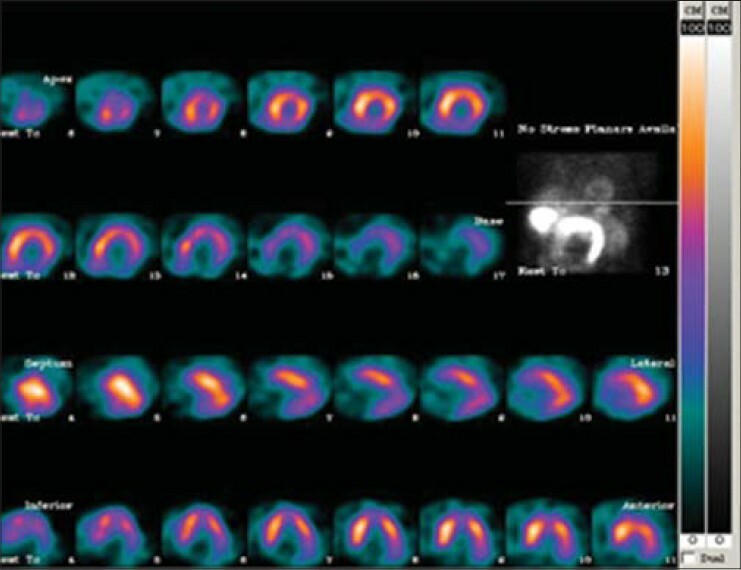 F-18 ﬂuoro-2-deoxy-D-glucose positron emission tomography/computed tomography (FDG PET/CT) is a functional imaging technique that monitors glucose metabolism in tissues. Pulmonary tuberculosis (TB) has been reported to show intense uptake of FDG, with a decrease in metabolism of the tuberculous lesions after successful anti-tubercular treatment (ATT). 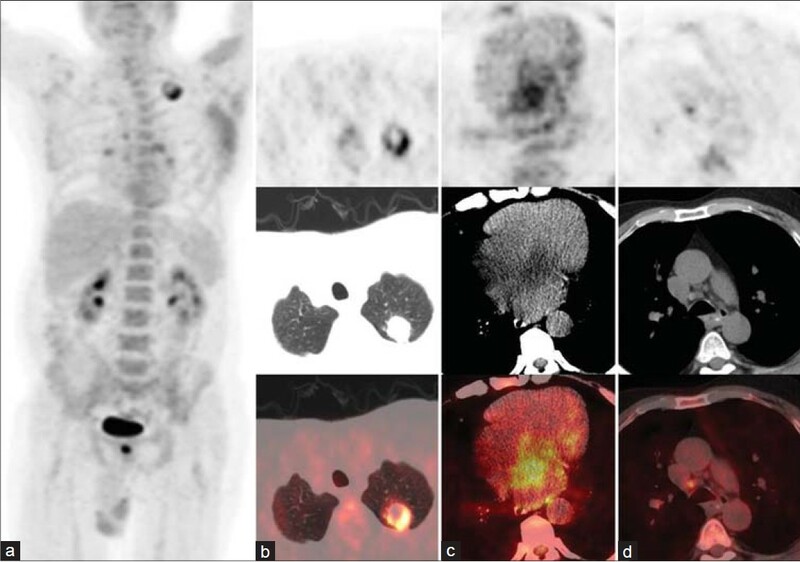 The authors present a patient with pancreatic TB and demonstrate the usefulness of FDG PET/CT in monitoring the response to ATT. Primary lymphoma of the bone is a rare clinical presentation constituting to <1% of all lymphomas. The long bones are usually involved. Combined treatment with chemotherapy and radiation offers long-term survival. 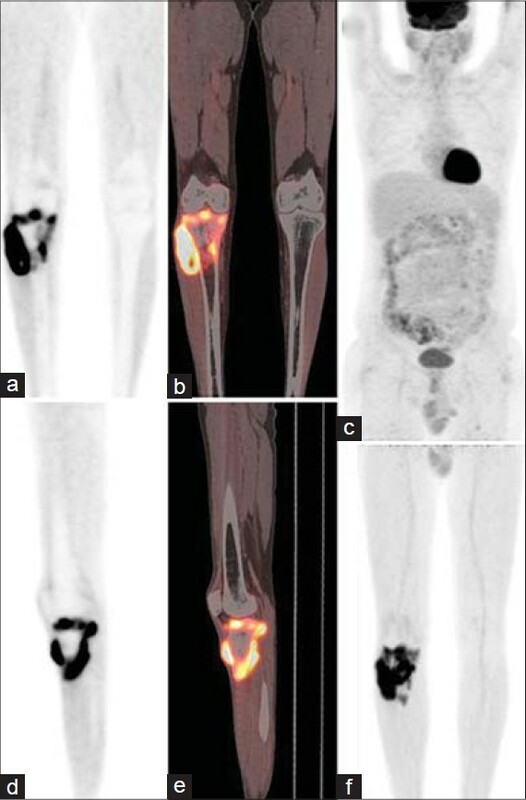 The authors present the role of 18 fluoride-fluorodeoxyglucose positron emission tomography-computerized tomography in initial staging and response assessment in a case of primary diffuse large B cell lymphoma of the tibia. 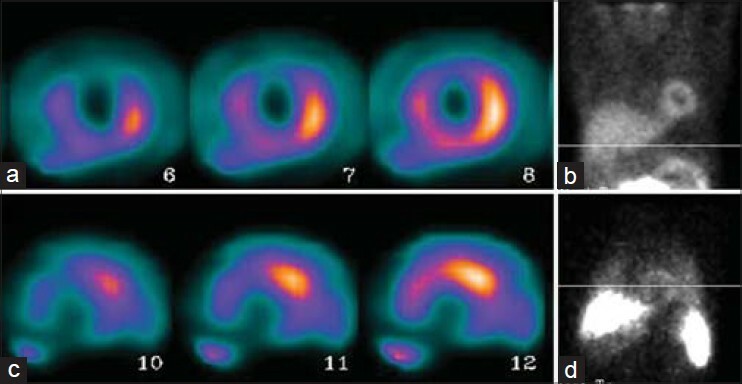 A 48-year-old man, a known case of Friedreich's ataxia (FRDA) underwent cardiac fluorodeoxyglucose (FDG) positron emission tomography -computed tomography (PET/CT) for evaluation of myocardial viability. Tetrofosmin images showed an enlarged left ventricular cavity with small mid and basal inferior and apical infarct global hypokinesia with ejection fraction of 39%. Fluorodeoxyglucose images showed poor quality myocardial images. Friedreich's ataxia is associated with a high incidence of diabetes mellitus. Non-diabetic patients with Friedreich's ataxia have insulin resistance. This is associated with a reduction in the affinity of insulin receptors and membrane abnormality that alters the binding function of the insulin receptor. A 56-year-old male having Grade I transitional cell carcinoma (TCC) of left kidney, postleft nephrectomy and upper 1/3 rd ureterectomy presented with painless hematuria. Restaging fluorodeoxyglucose (FDG) positron emission tomography/computed tomography (PET/CT) revealed abnormal linear FDG uptake in the lower 2/3 rd of the left ureter and in the bladder adjacent to the left vesicoureteric junction, no locoregional adenopathy nor distant metastases (Figures 1 and 2- left column). Patient underwent left lower ureterectomy with partial cystectomy. Postoperative histopathology was TCC. Instillation of Bacillus Calmette-Guιrin injection in the bladder was done postoperatively. A follow-up FDG PET/CT scan performed 3 months postoperatively was revealed no abnormal focal FDG uptake in the whole body revealing disease free status. FDG PET was helpful in diagnosing tumor recurrence in the distal remnant ureter. This case attempts to highlight the role of FDG PET/CT in follow-up, residual and recurrence evaluation. We present a patient with Meige like lymphedema (left lower limb hypoplasia) with asymptomatic minimal accumulation of Technetium-99m sulfur colloid in bilateral breasts.We attribute the possible pathology to accumulation of interstitial fluid in hypoplastic left lower limb leading to dilatation of the remaining outflow tracts and valvular incompetence. This may be causing reversal of flow from subcutaneous tissues into the dermal plexus involving the breast. Other possibilities include formation of spontaneous lymphovenous shunt or lymphatic intercommunication at lower trunk level as a result of increased pressure leading to minimal lymph accumulation in breasts. Later a mammogram was performed which was found to be normal. MR also confirmed no cisterna chyli abnormalities or aberrant lymphatic channels in lower thorax region that may be the explanation for the abnormal sulphur colloid uptake in both breasts. Rheumatoid arthritis is a chronic disease that is mainly characterized by asymmetric erosive synovitis, particularly affecting the peripheral joints. Radiation synovectomy or radiosynovectomy, also known as radiosynoviorthesis was first described in 1950's as a adjuvant treatment for rheumatoid arthritis. Radiosynovectomy is based on the irradiation of the joint synovium by the intra-articular administration of various β-emitting radiopharmaceuticals. Lu-177 has presence of gamma photons of imagable energy with low abundance which provides the additional benefit of carrying out simultaneous scintigraphy. We describe the first case report of use of Lu-177 hydroxylapatite particulates in a 35-year-old female patient who was presented with elbow joint synovitis due to rheumatoid arthritis. A secondary neoplasm of the thyroid gland is a distinctly uncommon cause of thyroid enlargement. These tumors mimic primary thyroid gland tumors and often lead to diagnostic difficulties. We report an interesting case of secondary thyroid tumor coexisting with a micropapillary carcinoma in an elderly male patient following a radical nephrectomy done 15 years prior for a renal cell carcinoma (RCC). Interestingly, the previously described coincidental association of thyroid and pancreatic metastases in a metastatic RCC was also noted in our patient as was demonstrated in the positron emission tomography-computed tomography which was done as part of the metastatic workup. This association needs to be further explored as also the role of palliative thyroidectomy in the setting of a metastatic RCC. The possibility of metastatic RCC should be kept as a differential during the course of the evaluation of clear cell renal tumor of the thyroid gland. Bone marrow stem cells having myogenic potential are promising candidates for various cell-based therapies for myocardial disease. We present here images showing homing of technetium-99m (Tc-99m) hexamethylpropyleneamine oxime (HMPAO) labeled stem cells in the infarcted myocardium from a pilot study conducted to radio-label part of the stem cells in patients enrolled in a stem cell clinical trial for recent myocardial infarction. Calcinosis, although frequent in juvenile dermatomyositis is a rare finding in adults. It is more common in later phases of the disease, involving sites under chronic stress and trauma. We present a 52-year-old female patient of dermatomyositis who on single-photon emission computed tomography/computed tomography hybrid images showed exclusive subcutaneous fat calcinosis, also known as calcinosis universalis - a phenomenon that is only rarely reported in adult-onset dermatomyositis. Angiomyolipomas (AMLs) of kidneys are one of the common extracranial manifestations of tuberous sclerosis (TSC). AMLs when large may cause life-threatening hemorrhage, but seldom undergo malignant degeneration. 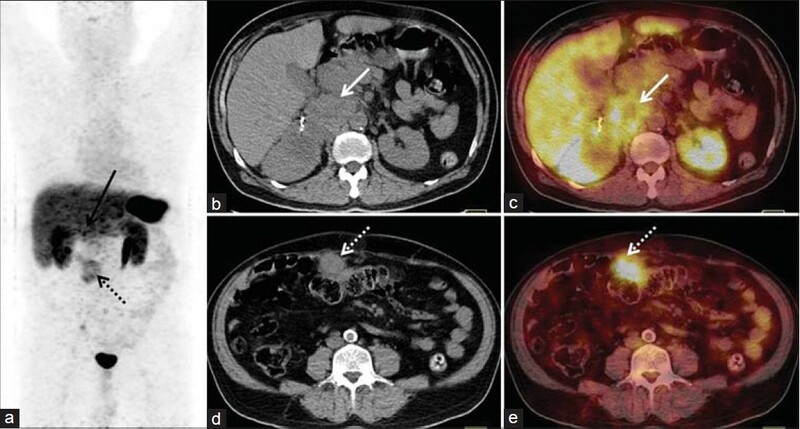 We describe the appearance of renal AML degenerated to angiosarcoma on 18 F-flruorodeoxyglucose positron emission tomography/computed tomography ( 18 F-FDG PET/CT) and contrast-enhanced CT (CECT). A 66-year-old male patient presented with low grade fever without chills associated with simple partial seizures. 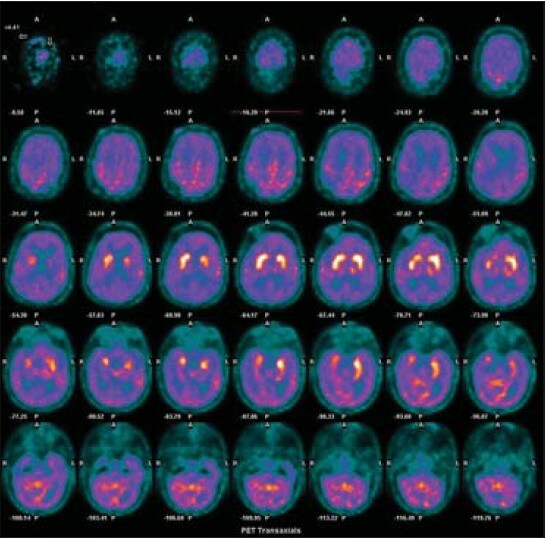 He was advised whole body positron emission tomography-computed tomography (PET/CT) (fluorodeoxyglucose PET/CT) scan which demonstrated an increase in metabolic activity in the limbic system. There was no evidence of active disease anywhere else in the body. 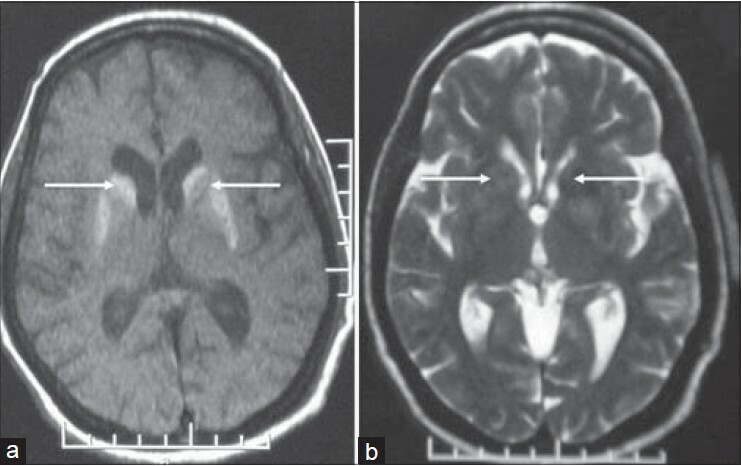 Thus, in the setting of limbic encephalitis PET-CT helps in locating the cancerous origin as well as gives information about functional abnormality of the brain. The information regarding fluorodeoxyglucose (FDG) uptake in benign and malignant cardiac tumors is limited in the literature and most of the currrently available data were derived from single case reports. Herein we reported coexistence of atrial myxoma and lung cancer on FDG positron emission tomography/computed tomography with the aim of emphasizing the importance of distinct FDG uptake pattern on differential diagnosis. Pheochromocytomas are rare catecholamine-secreting tumors derived from the sympathetic nervous system. The most common sites of metastasis for pheochromocytoma or extra-adrenal paraganglioma are lymph nodes, bones, lungs, and liver. Patients with known or suspected malignancy should undergo staging with computed tomography (CT) or magnetic resonance imaging as well as functional imaging (e.g. with 123 I/ 131 I-MIBG ( 131 I-metaiodobenzylguanidine) and 68 Ga-DOTANOC ( 68 Ga-labeled [1,4,7,10-tetraazacyclododecane-1,4,7,10-tetraacetic acid]-1-NaI3-octreotide) positron emission tomography (PET)/CT) to determine the extent and location of disease. 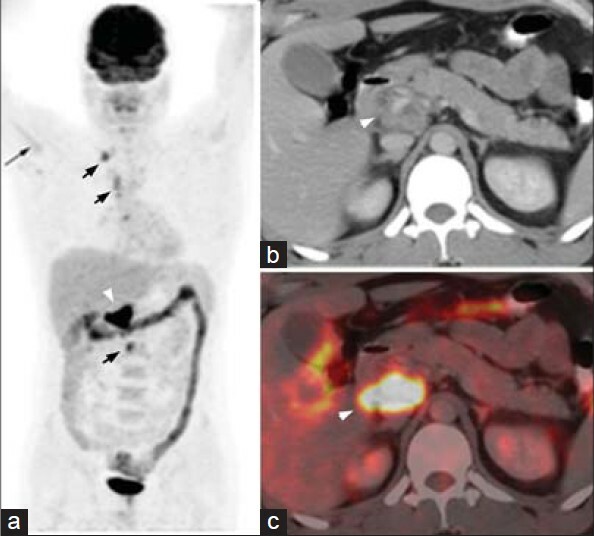 We present a case of recurrent malignant pheochromocytoma with unusual site of metastasis in omentum, which was positive on 68 Ga-DOTANOC PET/CT and 131 I-MIBG single-photon emission computed tomography (SPECT/)/CT scintigraphy. A 60-year-old male who underwent left upper lobectomy because of recently diagnosed lung cancer was admitted to the nuclear medicine department. A whole body fluorodeoxyglucose positron emission tomography/computed tomography (CT) that was performed for staging purposes, revealed an intense hypermetabolism in left vocal cord region corresponding with hyperdense mass-like material on CT scan.